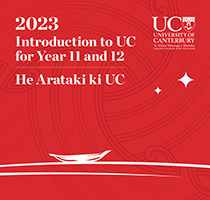 An at-a-glance guide to life and study at UC, including UC's support services, student community, extra-curricular opportunities, and the first degrees you can study out of secondary school. Order a copy by phoning or emailing the Contact Centre. Hard copies are also available at events such as careers expos, Liaison visits to schools, and Open Day (July). For course advice, or any other queries please contact UC Student Liaison. See also our Get started website.